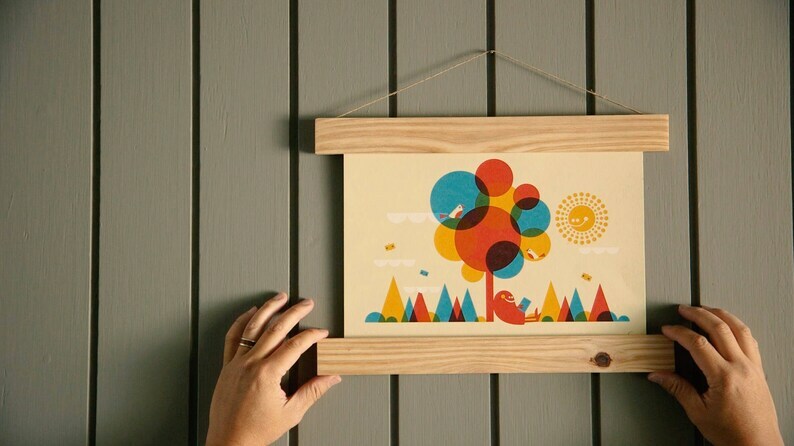 These magnetic wood picture hangers take the hassle out of getting art on your walls. No levels, no heavy frames, no glass, no custom framing fees, no damage to your art. These hassle free magnetic hangers get your art up in seconds. Each frame begins with a piece of wood lath cut to your specifications (if you need something larger than 24" get in touch), sanded smooth, then treated with a clear polycrylic to protect its finish before the super industrial strength magnets are drilled into both the top and bottom rails. A strong piece of hemp twine is then thread into the top rails for quick and easy hanging. Note: some folks like their frames slightly larger than the width of their poster. We will create the frame to the specifications you share with us when ordering. If the frame will be larger than your print, please let us know the exact dimensions of your art so we can place the magnets accordingly. We recommend an extra inch (i.e. if your print is 12", order a 13" hanger) or an extra two inches for larger prints (i.e. if your print is 20", order a 22" hanger). The grain of each piece of wood varies and your item may look slightly different than what's pictured. We are happy to ship anywhere in the world, though we are not responsible for delays, VAT or other import taxes and fees you may incur via your local customs office. Stunning. Beautiful for art work you want to show off in a different way!